Saturday night was the tenth annual Mid-Century Supper Club's holiday potluck and, as is customary, photos from it have been flooding my feeds since it ended. 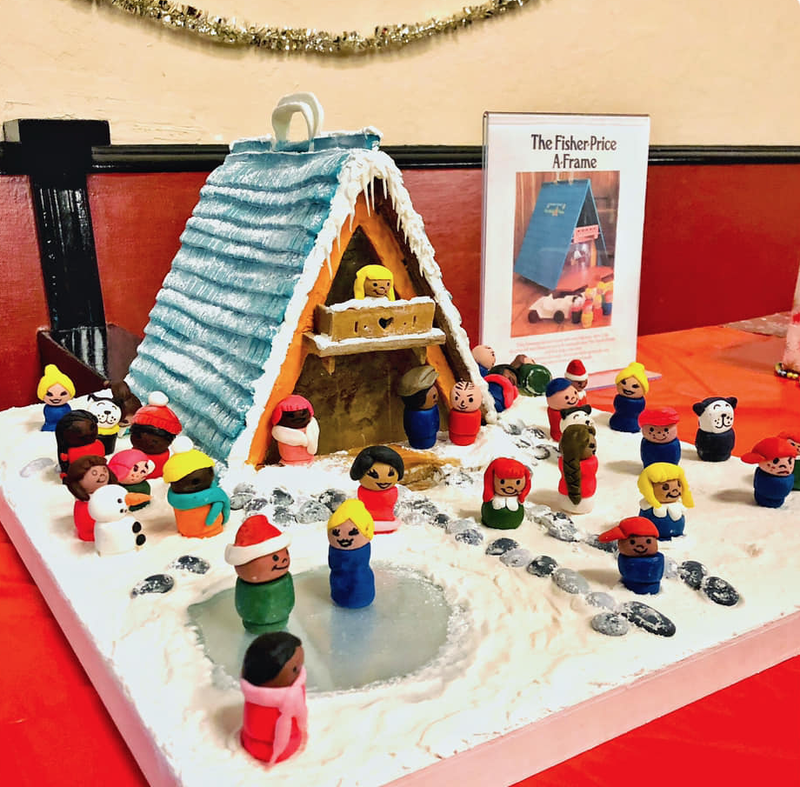 Once again, there were lots of great creations (and costumes, whoa boy) but I was particularly gobsmacked by this gingerbread (and candy clay) house fashioned after the circa 1974 Fisher-Price A-Frame dollhouse. Its creators are pals of mine here in Alameda, Jo Anne Yada (aka art teacher Ms. Y) and Michael Fleming (aka illustrator Tweedlebop). Jo Anne shared on Facebook that they picked up an actual vintage Fisher-Price A-Frame toy this past summer at a yard sale and that's when inspiration struck, "We knew even waaay back then that we would be recreating it in gingerbread..."
They estimate the edible A-Frame took over 20 hours to complete. Michael focused on the house itself (he jokingly shared, "There was a learning curve.") and Jo Anne worked on the Little People. The People were made of fondant, with the faces drawn with cake decorating marker; half a toothpick holds the heads on securely. We really wanted to diversify the People in our scene, so we made a rainbow of skin colors to include more people in addition to the classic yellow-and-red haired ones. And of course, we had to include the dog! For their efforts, they won the potluck's People's Choice award. And, they're already starting to think about what they'll create next year. Can't wait!